I hope that you enjoyed your Thanksgiving holiday! Mine went well, and you can be sure that after enjoying three full Thanksgiving dinners, I will not be stepping on a scale anytime soon. I also hope to focus more on the dinner side of DINNERCAKES after my baking blitz on Wednesday resulted in 6 pies and 3 loaves. Yes, I am a crazy person. If you’re planning on baking 6 pies, invest in more than one pie dish. The pie tins at the grocery store just don’t cut it, it’s still flimsy even after you double up with two tins per pie and it increases your cook time. Next time I will enlist the help of some reasonably priced Pyrex pie dishes. Making pie dough from scratch doesn’t have to be a harrowing experience. I used Martha Stewart’s Pate Brisee recipe, refrigerated the dough overnight, let it sit out for 10 minutes before working with it, and then just rolled it out to make crust. If 4 out of your 6 pies require graham cracker crust, just buy a box of graham cracker crumbs instead of using a meat tenderizer to demolish whole crackers. This saves time and sanity. Any marks left in your pumpkin pie after inserting a knife to make sure it’s fully cooked can be easily disguised with a leaf or heart shape made using extra dough. Do not open a bottle of champagne until you’re done. My pie extravaganza included: Heavenly Pie from 101 Cookbooks, Triple-Chocolate Pumpkin Pie from Martha Stewart, Crunch Top Apple Pie from Paula Deen, my favorite Classic Pumpkin Pie from Libby’s, and two Million Dollar Pies adapted from Cooks.com. The Heavenly Pie is the only one that disappointed me. It’s a chocolate pie with tofu and cream cheese. I know it sounds odd, but it tastes like a delicious chocolate mousse. Unfortunately I can never seem to get the consistency right. This may be because I don’t have the assistance of a food processor, so if you have tried this recipe using one please let me know how it works for you. I can never get it to be completely smooth, I’m always left with little tofu granules. No matter how good it tastes, I don’t like the grainy presentation. 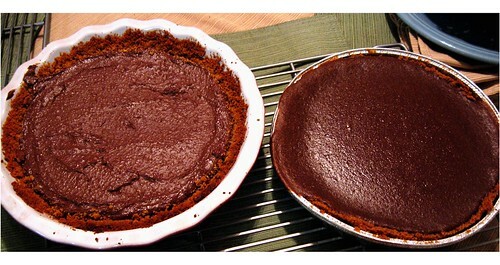 I first saw the Triple-Chocolate Pumpkin Pie in my Martha Stewart Living magazine (yes, I subscribe). I’m usually a purist with pumpkin pie – you know I love pumpkin, and my Libby’s recipe has never failed me. I’m so glad I tried this, though. This pie is absolutely packed with spices and it’s incredibly creamy. The layer of bittersweet chocolate spread over the crust before adding the filling gives it a nice kick, and when it’s cut it’s also very attractive. I did not drizzle milk chocolate over the top simply because I didn’t want to make a mess in someone else’s kitchen (so my pie was more of a double-chocolate pumpkin pie instead of a triple). 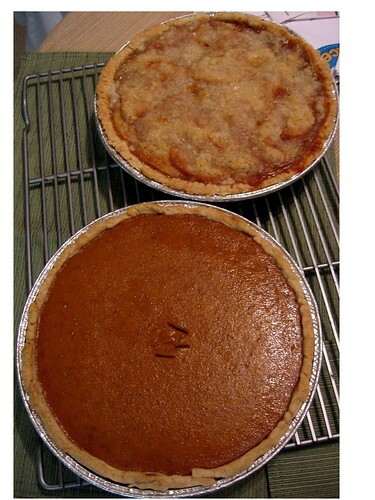 I’m glad I skipped that part because it is a very rich pie, which isn’t always the best idea after Thanksgiving dinner. This recipe also made a lot more filling than what would fit in the pie dish. I put the extra into some corningware to bake separately, and what I did pour into the crust spilled over a bit. Be careful! 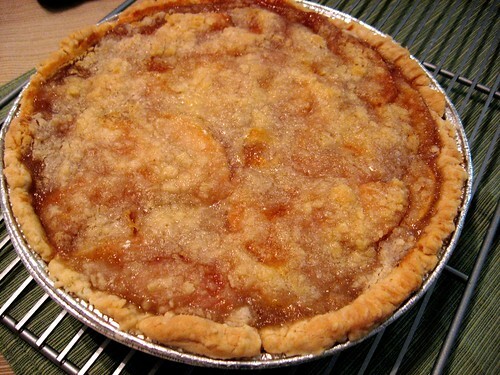 The Crunch Top Apple Pie from Paula Deen turned out very well. I liked that this pie didn’t need more pie dough for a top – because this was my first time making pie dough completely unsupervised, I didn’t want to take too many risks. I used Martha Stewart’s Pate Brisee pie dough recipe instead of Paula Deen’s. I also packed in an extra cup of apples and I thinly sliced them instead of chopping. The top wasn’t “crunchy,” so I’m not sure about Paula’s naming of this pie, but it was very tart and tasty. My brother first had Million Dollar Pie at a restaurant called Fisherman’s Wharf in Wanchese, NC. I believe he got the waitress to give him the recipe, but who knows where it is now. I used the Cooks.com recipe to recreate this pie for him. It’s not necessarily a Thanksgiving pie, but it does provide a nice, light alternative to many of the heavy pies usually featured on Thanksgiving. It’s also incredibly easy, and you can add more or less of whatever you do or do not like. , combine about 2 cups of graham cracker crumbs with 6 tablespoons of butter. 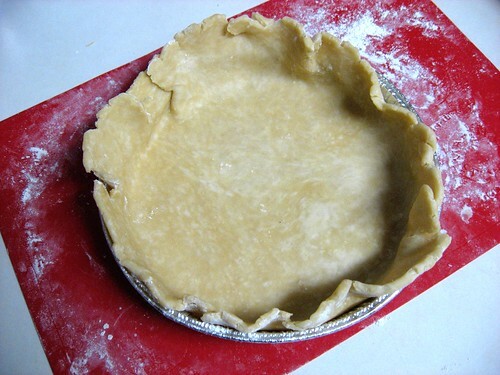 Press the crumbs into your pie dish to form the crust. Bake for about 8-10 minutes in a 350 degree oven until it’s hard (without filling). Edwin and I would love to hear what you made for Thanksgiving and how it turned out; please comment below to share it with us. Also, thank you for all the kind and encouraging words from friends, family and new visitors in support of DINNERCAKES – we appreciate it! Oh, Thanksgiving, how I love thee. You bring me such delicious food, time with family and of course a day off. In the days/weeks/months to come I will scorn you. I will blame you when I step on a scale, when my pants don’t fit as well as they did during the summer. But in truth, you are but one day of the year. You are a glimmer in the dark, cold winter months to come. It’s not your fault I brought back with me all those leftovers; not your fault I kill the indoor boredom through excessive baking. Please, don’t take my predictable frustration to heart. Rest assured I will look forward to your return next year with many a recipe to make. This was a good Thanksgiving. My grandparents were visiting from Chicago for the month so we had three cooks in the kitchen. Despite the cliché about too many cooks spoiling the broth, things worked out very well (we didn’t do any soup). Mom was head chef, handling the bulk of the dishes with Oma (Grandma) and I taking care of a few sides on our own. We started around 9:00 in the morning and cooked till 2:00. Of course there was too much food and of course it was all excellent. We had a reader request a few weeks back for a fancy candied yam recipe. 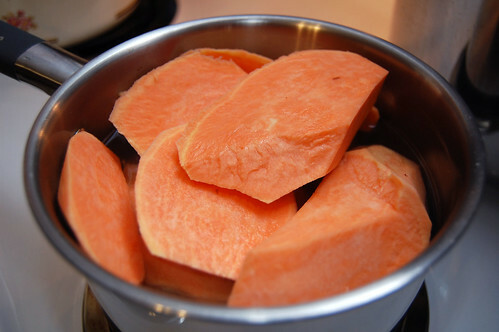 When most people use the term yam in the United States, they’re not really referring to actual yams, but a type of sweet potato common in most grocery stores. Like white potatoes, sweet potatoes are a great source of vitamin C and since they have a much lower glycemic index I try to substitute with them whenever I can. 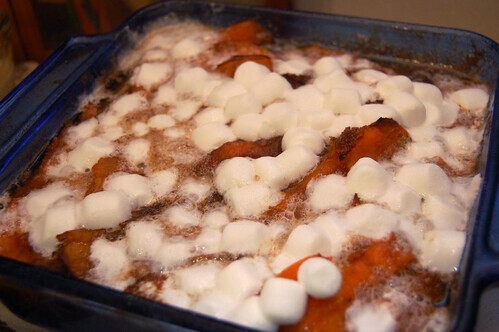 I had never made candied yams before but it turns out my grandmother on my Dad’s side had a popular recipe that she passed along to my Mom before she passed away. Thanksgiving was the perfect opportunity to test this out and test it out I did. This recipe is anything but fancy but still gets my stamp of approval. Editorial note: I love my mother, but she has a few annoying tendencies in the kitchen that irritate the hell out of me. One of them is using far too small a pot for the job. Please, use a bigger pot. 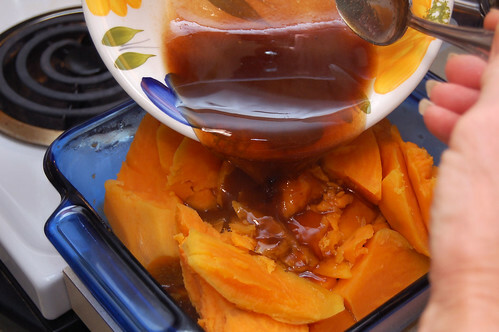 If you have really large sweet potatoes, consider adding more brown sugar; a quarter cup at the most. The size of the baking pan isn’t important just so long as the entire bottom is well covered. We used a 9×9, but a 9×12 would probably work as well. Cut the sweet potatoes into large chunk of roughly equal size and boil until softened but not falling apart. Depending on the sizes you cut, this will be approximately 20-30 minutes. While the sweet potatoes are boiling, combine the sugars and butter in a medium heat resistant bowl. Strain the sweet potatoes when ready, preserving the liquid, and put into a glass baking pan. Let the preserved water sit briefly so that the heavy stuff from the boil settles to the bottom. Then, depending on the amount of water you started with, pour out 2-3 cups of the liquid “on the top”. This isn’t an exact science here so don’t worry about exactly how much water you pour out or how much of the heavy stuff is lost. Spoon 2 cups of the liquid, heavy stuff and all, into your sugar bowl and stir. Pour over your sweet potatoes. Roast in the oven for 30 minutes, sprinkling the marshmallows when there is five minutes left. Remove and serve within 30 minutes. Hola, from DinnerCakes HQ. We just wanted to wish you all a happy and safe Thanksgiving. Eat plenty of turkey and we’ll see you all back here on Friday. My dad does not eat red meat. He doesn’t eat real cheese, eggs, butter, or anything that was baked in a pan greased with Crisco, either. So when he called yesterday and asked if anything I was bringing home for Thanksgiving was “dad-approved,” I got a little quiet. 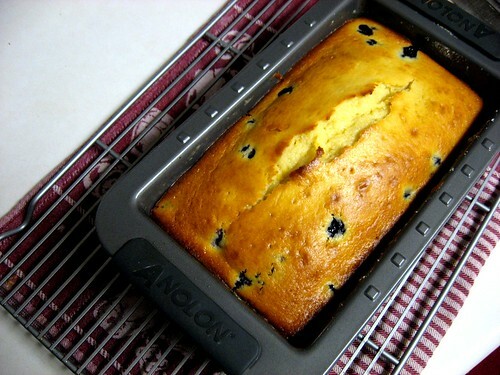 Then I remembered a recipe I saw on Smitten Kitchen a few months ago for Lemon-Blueberry Yogurt Loaf. I knew that my dad would love it… if it wasn’t for the whole-milk yogurt, three eggs and oil. One of the first rules of holiday baking I learned from my mom was to always use fresh, high-quality ingredients. I’m not sure that Egg Beaters and fat free yogurt comply with this rule, but I had to try! Egg Beaters have no fat or cholesterol, and they’re made with real eggs. The egg whites are separated from the yolks and combined with vitamins and thickeners. In some recipes you may not even notice a difference, in others a lot could change. I replaced the whole-milk yogurt with a combination of Stonyfield Farm’s organic, fat free plain and lotsa lemon yogurt. I also used Smart Balance Omega Oil in place of canola or vegetable oil. My blueberries sank a little bit, but I think if I had been more cautious while pouring the batter into the pan I could have avoided some of this. In any event, the result was an incredibly moist cake bursting with tart lemon flavor. Hopefully dad feels the same way! Preheat the oven to 350 degrees F and spray your loaf pan with Smart Balance cooking spray. Line the bottom with parchment paper and spray again. Sift 1 1/2 cups flour, baking powder, and salt into a medium bowl. In a large bowl whisk yogurt, 1 cup sugar, Egg Beaters, lemon zest, vanilla and Smart Balance oil. Whisk the dry ingredients gradually into the wet ingredients. Rinse blueberries in a small bowl and mix with 1 tablespoon of flour. 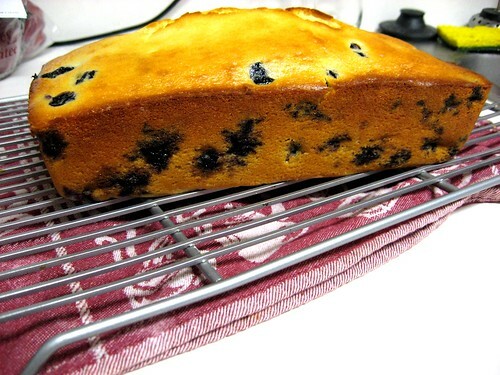 Gently fold the blueberries into your batter so that they do not burst. Pour batter into loaf pan and bake for about approximately 55 minutes, or until a toothpick inserted in the center comes out clean. Note that using Egg Beaters may increase your cook time a little. While the loaf is baking, combine 1/3 cup lemon juice and 1 tablespoon sugar in a small pan on your stove until the sugar dissolves. Set pan aside. Cool your loaf for 10 minutes before flipping out onto a wire rack. Lay a pan underneath the wire rack and poke a few small holes in the loaf using a toothpick – pour the lemon and sugar mixtures over the loaf while it’s still warm. Cool completely and wrap tightly. Sometimes I forget that most people don’t have the fondness for vegetables that I do. I think this is largely in part to their childhood memories at dinner. Many a vegetable has been overcooked in the mad dash ritual of the family dinner. What at one point was vibrant and full of flavor can easily become dull and tasteless. Of course this is not an attack on our loving Moms and Dads (mine rock), but life can get hectic when you’re balancing a career, home life and the numerous extracurricular functions of your children. 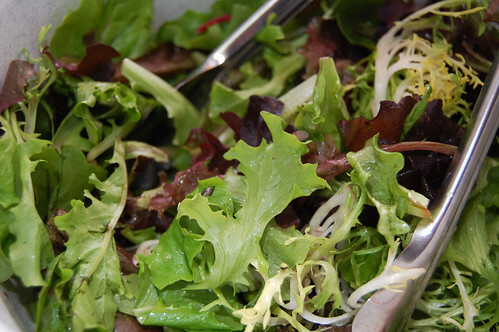 Quality food doesn’t have to be difficult or overly time consuming. You can still have delicious tasting veggies with minimal effort that won’t leave you shaking yourself (or your child) in rage. This is a simple roasted vegetable recipe. With the sesame and soy sauce, it’s easy to peg this as an Asian-only side dish; but I disagree. Serve these vegetables alongside grilled fish or a lightly breaded chicken breast with lemon – add some brown rice and you’ve got yourself a flavorful and healthy meal. Oh, and did I mention roasting preserves more of the vegetables’ nutrients than boiling? Man, this dish rocks all kinds of worlds! 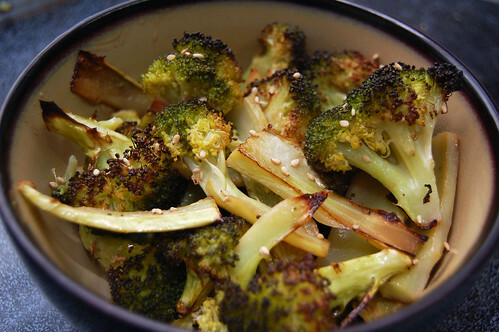 This dish works with both the broccoli florets and the stalks. I like a little of both for variety, making the florets that much more enjoyable in contrast. Go with whatever you like. Consider adding sesame seeds before serving, though I find this purely decorative. To slice the broccoli, cut up into the florets, not all the way through. Then split by pulling the broccoli apart. For the stalks, cut into 1/4 inch slices. 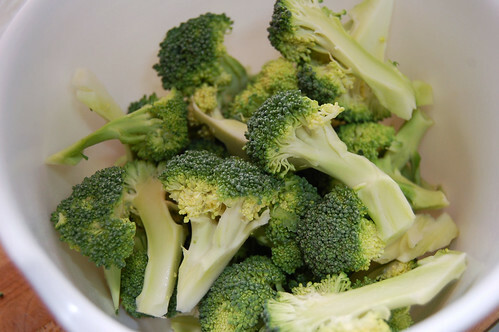 Combine the broccoli, olive oil, sesame oil and soy sauce in a mixing bowl. Place in a baking sheet as a single layer (this will help you get a good browning). Roast in the oven for 20-25 minutes, tossing halfway through. Remove when the tops are crispy. Serve immediately. Thanks to Tastespotting, yesterday we experienced many new visitors to our site. Edwin and I would like to thank you very much for your interest in yesterday’s post. At DINNERCAKES we like to post about what’s for dinner, with an extra helping of dessert. However we were very proud yesterday to create and share not only a lovely cake, but to do so in memory of someone who was very special and is very missed. From the moment Edwin and I saw this cake, we knew it was always our destiny to bake it. And its creation had special meaning for me. I first learned of this cake a few months ago from mine and my husband’s friend Jeff. Jeff found the cake on Smitten Kitchen and demanded that we spend a day baking and gorging ourselves on it. He found out a few weeks after this that the cancer he’d had for two years was terminal, but he had such an incredible attitude that he just continued making plans for things he wanted to do, see and eat. Making this cake together remained on the top of his list. Unfortunately things went down hill incredibly fast, and my husband, Morgan, and I were with Jeff when he died in mid-September. 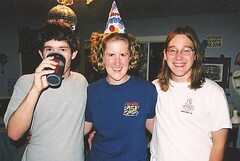 The three of us had been friends for a long time; he was the best man in our July wedding, one month before he found out he was terminal and two months before he died. I think there may always be a hole in our lives and in our hearts where he was. A few weeks ago Edwin sent me a link for this cake. I thought about the plans I had to make it with Jeff and I hesitated. Then I remembered how after Jeff’s death, at his request, we had thrown a celebration of his life where each of his friends either brought over a dish they had shared with him or some food that he loved. I realized that making this cake with Edwin was probably an excellent way to honor my friend and celebrate the things he loved most – food and friends. Thus, Edwin and I set a date and embarked on what we both knew would be a challenging journey. 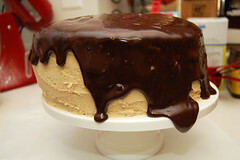 The elusive sour-cream chocolate cake with peanut butter frosting and chocolate-peanut butter glaze had been taunting us to bake it for quite a while. 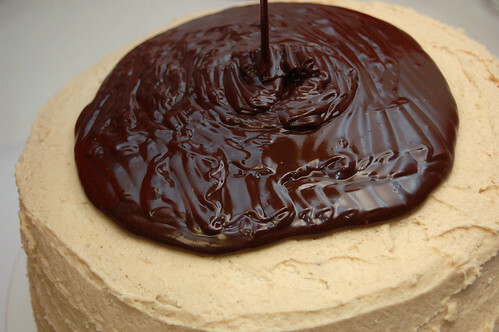 The result – “This might be the best cake I’ve ever had,” crowed Edwin. Even Morgan agreed, who can usually take or leave cakes. Nothing was overpowering about the cake, and although it may appear dense in photos, it’s actually very light and incredibly moist. However, it is extremely rich. A cold glass of milk is vital for the prevention of a sugar-induced coma. This beauty of a cake packs away 2 ½ cups of sugar in the cake batter and 5 cups of confectioners’ sugar in the frosting. 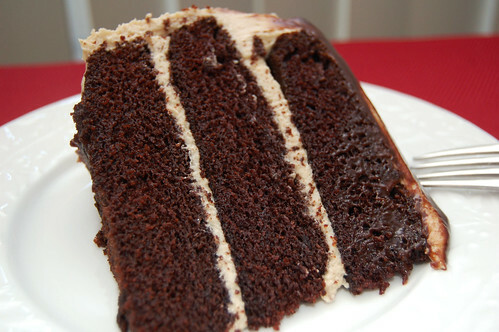 If you have diabetes or a heart condition, this cake is not for you! But now that all is said and done, our dream cake has been enjoyed and divvied up between us, and we’ve exceeded our sugar quota for the entire week, we can’t think of a better way to kick off Thanksgiving week and the holiday season than to share this amazing recipe. 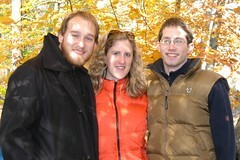 Edwin and I are thankful for good friends, good food and good times past and present. And I am thankful that, although I did not get to make this cake with Jeff, I was able to share so many other wonderful memories with him. Hope this beautiful cake kick-starts your Monday! Happy Thanksgiving week from Dinnercakes! Preheat the oven to 350 degrees F. Butter the bottoms and sides of three 8-inch round cake pans (we used three 9-inch rounds so our cakes came out a little thinner). Cut three rounds of parchment paper to line the bottom of each pan; butter the parchment paper. Sift flour, sugar, cocoa powder, baking soda, and salt into a large bowl. Whisk to combine. Add in oil and sour cream; whisk to blend. Beat in water gradually (we used a stand mixer, but you can also use a whisk). Add vinegar and vanilla. Beat in eggs until well blended. 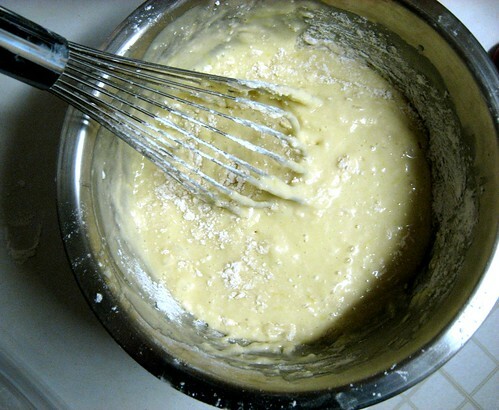 Scrape down the sides of the bowl to ensure batter is well-mixed. Divide evenly between 3 prepared pans. Bake for 30 to 35 minutes, or until it passes the toothpick test. Cool in the pans for 10-20 minutes. 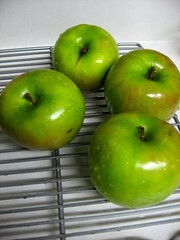 Turnout onto wire racks, carefully peel off the paper liners, and firm them up in the freezer for 30 minutes. 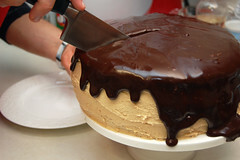 To frost, place one layer flat side up on a cake stand or serving plate. 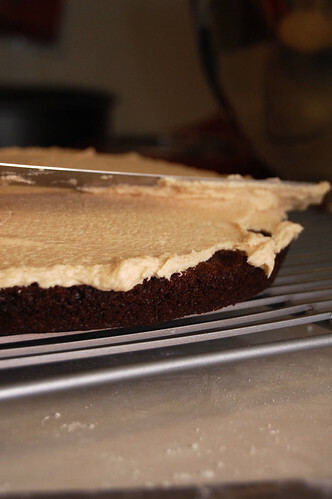 Spread Peanut Butter Frosting evenly on top, repeat with the next layer. Place the last layer on top and frost the entire cake with a thin layer of frosting – you are going to make a crumb coat; this part is crucial (a crumb coat keeps crumbs from showing up on your final layer of frosting). Put the cake (with a thin layer of the peanut butter frosting all over) back in the freezer for 20 minutes. The frosting will now be somewhat firm on the cake, now you can use the remaining frosting to cover the entire cake, without a crummy mess! When fully frosted, you may want to chill again for 10 minutes. To decorate with the glaze, set the cake plate on a sheet of parchment paper to catch drips. 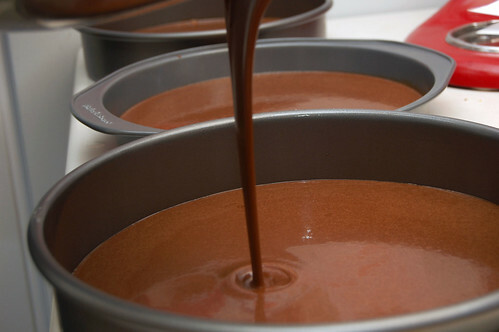 Pour the glaze directly over the center of the cake, and using a spatula, spread it lightly over the top and to the edges so that it falls down the sides in large drips. To set the cake, you may want to refrigerate it again when you’re done. Edwin and I didn’t make it that far and instead we chowed down immediately. 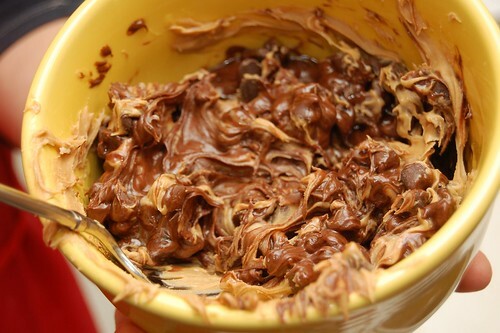 Beat the cream cheese, butter and peanut butter until light and fluffy in a large bowl with a mixer. 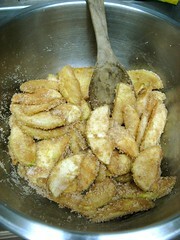 Add the confectioners’ sugar gradually, mixing thoroughly and scraping down the sides of the bowl often. Continue to beat until blended, about 3 to 4 minutes. I didn’t have a double boiler, so we used to the microwave method, heating for 15 seconds at a time and stirring after each 15 second interval. If you do have a double boiler or a metal bowl that you can set over simmering water, combine the chocolate, peanut butter, and corn syrup. 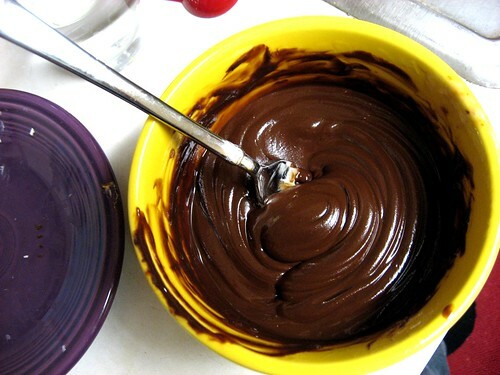 Cook while whisking often until the chocolate is melted and the mixture is smooth. Last, remove from the heat, whisk in the half-and-half and beat until smooth. Pour over the cake while still warm. I had a friend in high school who moved to the United States from São Paulo, Brazil. One day after school, she took me back to her house and taught me how to make a deliciously sweet and simple Brazilian treat known as brigadeiro. A brigadeiro is made using cocoa and condensed milk, a thick and sticky blend of milk and sugar that yields some of the most decadent and rich desserts I’ve ever had. It combines all the things that make my ideal candy – smooth, sweet, and full of unadulterated chocolate. My friend rolled her brigadeiro in chocolate sprinkles (the most common way) and placed each candy in a tiny paper wrapper. But you can get as creative as you like, incorporating any number of sumptuous outer coatings including coconut, pistachios, almond shavings, powdered sugar, more cocoa, etc. I tried to make brigadeiro around this time last year and I failed. I lost the recipe my friend gave me (in my defense, it was almost 10 years ago), and I decided to follow a recipe I found online. I had also forgotten most of the instructions, which are actually pivotal in this recipe, and the recipe online gave little guidance. After deciphering some “how-to” videos in Portuguese, I’m proud to say that I’m back in the brigadeiro-making ring. And just in time, too, because these are absolutely excellent to bring to any kind of holiday party. The Portuguese videos I watched did not use 1 tablespoon of butter, something that many recipes I found online called for. Since my butter-free recipe worked very well and the experiments with butter did not, I did not include butter in the recipe below. If you think butter is a must, I’d love to hear it! Enjoy, and good luck not eating them all in one day! Heat 1 can of sweetened, condensed milk in a small pot on medium-low heat, stirring frequently. Sift in one tablespoon of cocoa at a time (I didn’t use a sifter this time because my sifter was MIA, and you can clearly see little deposits of cocoa in my photos. It still tastes great if you don’t sift it, but you may want to do it to achieve aesthetic perfection). 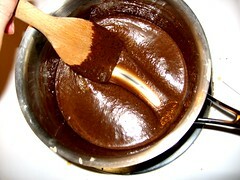 Use a wooden spoon to combine the cocoa into the condensed milk. Stir, stir and stir some more! Don’t stop stirring or else your chocolate could burn. After about 5 minutes, you’ll notice the mixture getting thicker. You can tell that it’s done when, while stirring, you are able to see a good bit of the bottom of the pot (see my photos for an example). Remove from the heat and pour onto a plate. Smooth the mixture out so that there’s a thin layer covering the entire surface. Set this aside, or if you can’t wait – set it in the fridge, for about 15 minutes. The mixture is ready when it’s completely cooled and hardened. Notice in my photo that I’m holding the plate at a 90 degree angle and the mixture hasn’t budged; you should be able to turn the mixture completely upside down without consequence (yep, just like they do Dairy Queen when you order a Blizzard). In the meantime, ready your chosen toppings. 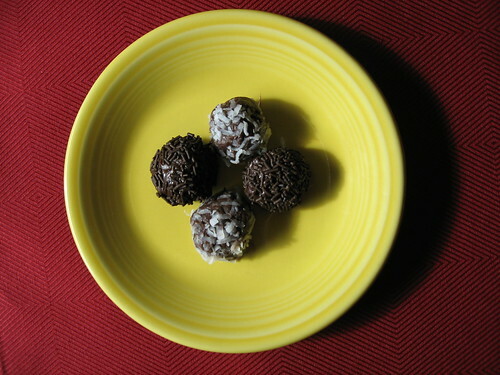 I used chocolate sprinkles and coconut flakes and added these to two separate, small plates. Using a spoon, scoop up about 1 tablespoon of your hardened mixture. It’s going to be very sticky! Using an additional spoon or very buttered and greased hands, drop it onto your topping and roll it until it’s completely covered and shaped like a ball. 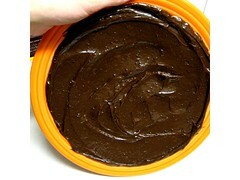 Continue scooping, dropping and rolling until you’ve used all your mixture. You may want to store these in mini paper cup wrappers; I just used a plate and covered it with saran wrap. You can try to share with others, but it’s hard! 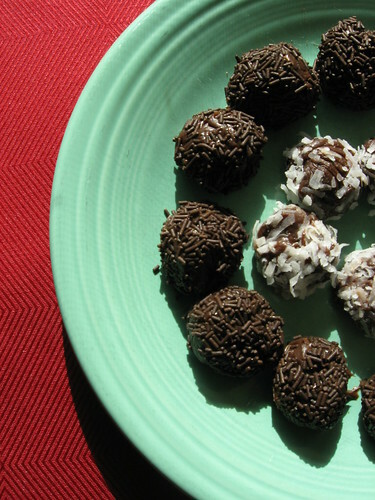 Many Brazilians actually eat their brigadeiro just straight out of a bowl with a spoon. 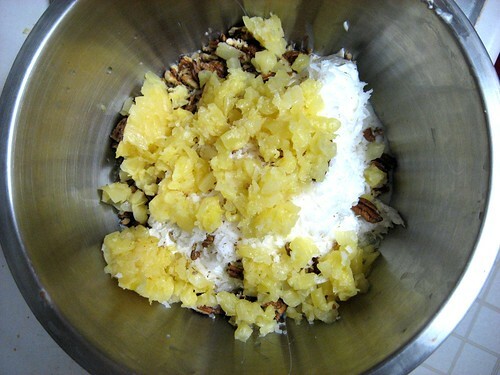 You can even use the mixture as a topping on ice cream or brownies. So really, you can’t go wrong! So it occurred to me recently that I really don’t know that many vegetarian main course dishes. To be fair, I know a lot of soups, salads and roasted vegetable varieties (or, at least I eat a lot of roasted vegetables). But when you take all those away I realize that I have a rather slim repertoire. Time for change. Time for something new, something inventive. And by new and inventive, I mean new and inventive for me. Tofu and I don’t really get along that well. To be honest, I’ve never had much luck with the stuff. It always struck me as something created to mollify wistful former carnivores who haven’t quite been able to let go. Psh. 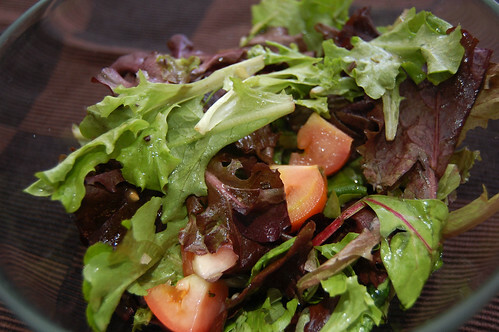 When prepared properly, fruits and vegetables (with the occasional accompaniment of grains or legumes) offer a myriad of flavorful meals to enjoy. But hey, gotta keep an open mind. Try new things. Expand horizons. This is a pretty classic tofu dish. I scoured the web for a handful of vegetarian recipes and let them flow into me as inspiration (deep, huh?). 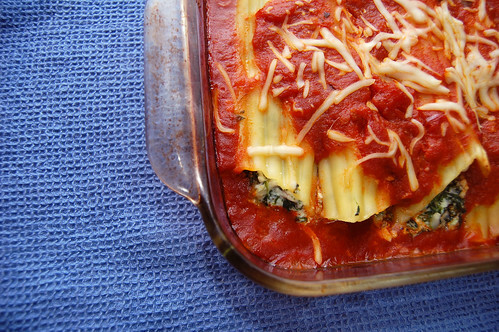 It is from this very zen moment that I was able to craft today’s recipe: Tofu Spinach Manicotti. No applause, please. The dish was good. Not knock-my-socks-off great, but definitely something I’ll do again. Next time I’ll sweat or saute the bell pepper and perhaps add some onion into the mix as well. I’m a saucy guy, so if you’re not as big on tomato sauce, cut back on the amount. Got a tofu dish you’re proud of? E-mail me and I’ll be sure to try it out. If making tomato sauce from scratch, make it first. Set aside and let it cool. Boil the manicotti as directed on the packaging. Drain and set aside. Toss with a bit of oil to prevent sticking. Crumble or chop the tofu into small pieces (think cottage cheese). 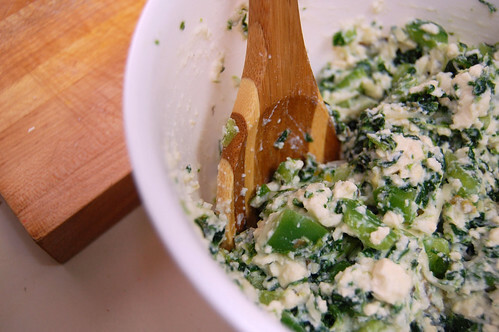 Combine with the spinach, ricotta, mozzarella, garlic bell pepper and salt. Poor about a cup and a half of the tomato sauce into a 9″x13″ baking pan. Stuff the manicotti noodles with the filling and line in the pan. Cover the noodles with the remaining sauce and sprinkle with some additional mozzarella. Place in the oven for 30 minutes. Remove and serve immediately.